David can not only eat a lot, but he can eat very quickly. When he accidentally charges $2,000 to his mother's credit card, he enters a pizza eating contest to win the money he will need to pay her back. Winning the contest is not the only challenge in David's life. His friends, HeyMan and Cyn, are spending more time with one another and not always including David and much of David's time is consumed with caring for his younger, autistic brother. The topic at the heart of the plot of this book, competitive eating, is a unique one for a middle grade novel. 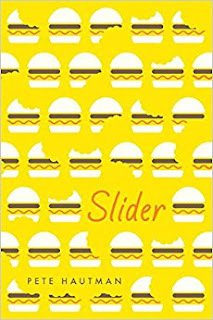 David's fascination with competitive eating is interesting and many young readers will be intrigued by the topic. This book is also a relatable one as it explores the family dynamic that David wrestles with as he is the middle child. His older sister is the perfect one and his younger brother is the one who needs constant care and attention. The book is also engaging because David is a personable character. Like many kids, at times he's responsible and at other times irresponsible. David's heart shines through, especially, in the interactions he has with his brother. This is a novel that readers will find funny, as well, as David has the ability to bring humor to even tense situations. Slider is a unique, funny, and thoughtful book. David is a character readers won't want to let go of. This book will be available in September. Thank you to Candlewick Press for providing my #bookexcursion group with an advanced reading copy of the book.